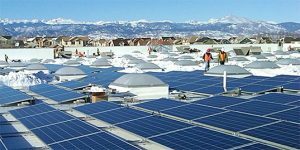 Denver tripled its solar power capacity in the last four years to 83 megawatts, which means that it’s graduated from crawling to baby steps. This Solar America City started building capacity 10 years ago with the installation of solar panels, and with that many megawatts, it can now power about 13,600 houses. Which would be great news, but the city has 311,462 housing units that will need about 1,900 megawatts of solar power. At this pace, Denver’s homes could be totally reliant upon solar power in about 200 years. But of course environmentalists don’t expect Colorado to be completely reliant upon green schemes to make us completely self sufficient without wind power. Just imagine the Denver skyline, Vail, Aspen, Telluride and other mountain cities with this view. Jared Polis says he has the vision to make it so, to make us all reliant on expensive renewable energy in just a decade or two. If you like that view, then Polis is your candidate for governor.